I just read Happens Every Day, and the narrator, definitely charming, has three unusual, defining characteristics: she was in Metropolitan (such a great movie -- Barcelona is, too), she shuns all contractions (which makes her sound extremely formal and New England-y), and she makes hot tea (at the drop of a hat whenever trouble is upon her). I'm serious -- she is always making tea because the whole book is a true story about a terrible time in her life. It rained a lot this afternoon; I felt like making tea, too, just like poor sweet Isabel. I drank a million cups of it (China green tips, chai, Earl Grey, peach mango, et. al.) and am still hopped up on caffeine. 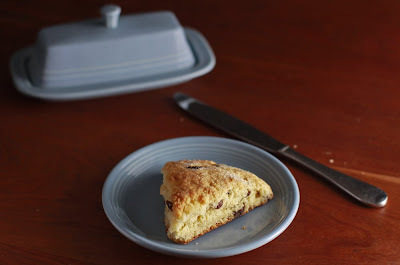 Obviously, there had to be some scone-making to go along with all this tea-brewing drama. 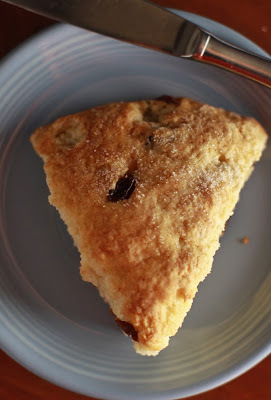 Lindsey told me about her own cream scones last year, and this time I used a pretty simple recipe that worked -- these scones were cakey instead of dry, and fulfilled the best measure of a dessert triumph: gone the same day because they're just that good. Puttanesca Pizza on Grilled Flatbread!